The TelCheck PRO is a must-have for the traveling PC notebook user. 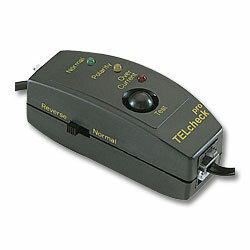 Whether at a customer site or in a hotel room, the TelCheck Pro will determine whether a telephone jack is on an analog or digital PBX system. This will prevent your expensive laptop computer from damage due to over-voltage on the line. Moreover, when connected to your modem, the TelCheck pro’s RFI filter will cut out disruptive electromagnetic and radio frequencies, giving you the cleanest connection available.